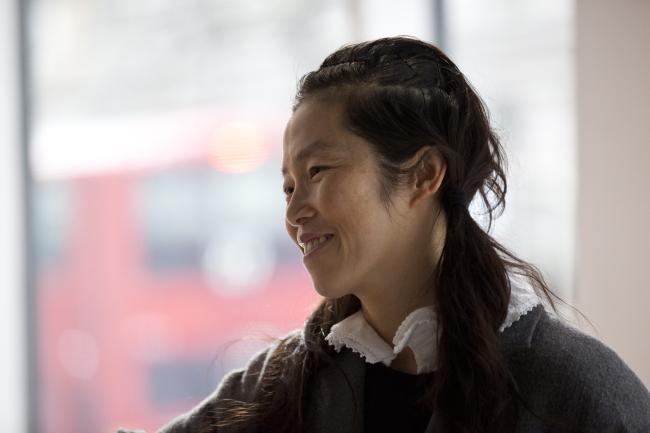 LONDON -- In 2000, artist Koo Jeong-a was commissioned by a Swiss cultural foundation to write a book. Handpicked by renowned German art curator Beatrix Ruf, who is now director of the Stedelijk Museum in Amsterdam, she felt thrilled to be the sole winner of the annual artist book project. But she didn’t feel confident about writing. Instead of expressing her thoughts in words, she chose to do what she did best -- draw. She created 1,001 line drawings as records of her daily life, named them “Civilizing Process” and published them as a book in 2006. It was the beginning of a number of art projects, including the ongoing group show at the Korean Cultural Center UK in London. “They are short stories of my life. I traveled, did many art projects, met a lot of people, read and saw many things during the book project. So they represent my life,” Koo said in an interview on Oct. 6. On display at the newly furbished exhibition space at the KCCUK are 20 drawings printed and framed at a larger size. Drawings depict a big flying bird snatching a man, detailed depiction of a furnished room and a jumping man. “There are lots of bird drawings because I was raising ducks when I was living in Rome in 2000. The city government didn’t allow people to have pets at home. But I wanted something fun to happen and liked ducks. So I adopted five ducks from my friend. One time I had to leave my ducks alone at home and go to Mexico for an art project. I kept thinking about my ducks while I was away,” said Koo, who was named KCCUK’s artist of the year, following Lee Bul in 2014 and Kim Sora in 2015. Since the mid-1990s, Koo has exhibited across the world, mainly outside of Korea. She held shows at major international biennales, museums, and galleries. In 2010, she has held a solo show at DIA Art Foundation in New York and at Kunsthalle in Dusseldorf in 2012. She participated in Venice Biennale, Gwangju Biennale, Real DMZ Project in Korea, and most recently in Liverpool Biennale. “When I went to Paris to study, I had so much curiosity about the world outside of Korea. The school was an excuse for me to meet a lot of people, exhibit wherever I find space for my work,” said Koo. “I easily adjust to a new environment and try to discover what’s there,” she added. She believes her drawings are mediums that deliver her personal experience to viewers and also represent something bigger. “The drawings reflect the multicultural life I have had so far: I grew up in Seoul, lived in Paris, moved to London and Berlin, flew to many countries, worked alone, had meals in different countries and cultures. We are living in a world where everyone is constantly on the move on airplanes and buses and where everything operates around mobile phones. So I think the drawings not only reflect my mobile life, but also the current mobile world,” she said. The group exhibition invites seven international artists and teams whose installations, videos and sculptures respond to Koo’s drawings. Here, young artists explore the gallery space and present their own interpretations of Koo’s drawings. 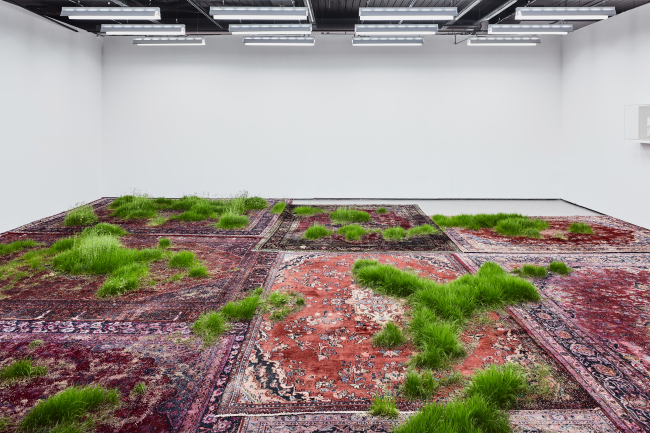 The gallery space remains lively with green grass that grows on Persian rugs -- an installation project by Austrian artist Martin Roth. Roth waters the grass twice a day until the exhibition ends on Nov. 19. “You have to take care of the artwork. If not, it’s not an artwork. It’s art only when it’s alive,” said Roth. Particularly inspired by Koo’s bird drawing, Korean artist Yva Jung seeks to add new meanings to discarded objects as Koo brings her random daily incidents into life in drawings. Artist duo Hanqing Ma and Mona Yoo plays with the gallery space itself. 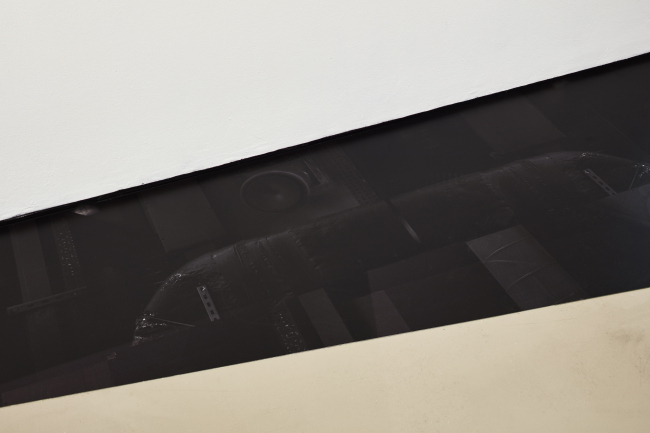 They took photos of the architectural structure of the gallery space, made a collage and printed it in a darker tone and posted them on the floor at corners of the gallery where viewers would easily pass by without noticing. “We may need to put a ‘mind the work’ sign in front of the works, but the point is to let people explore the space and find it on their own,” said Ma. “Koo Jeong A: Riptide” runs until Nov. 19 at Korean Cultural Center UK in London. For more information, visit www.kccuk.org.uk.